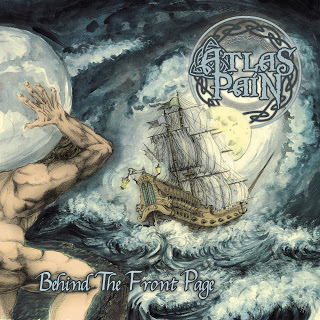 Already reviewed their demo before (here), Atlas Pain are back with their new EP Behind The Front Page, it was released on May 18th. They call the genre they play epic folk metal and while I could completely understand that with their demo, I hear, together with the folk metal, also a lot of power metal in this new EP, so maybe you can call it epic powerfolk metal or something. The production is a lot better, the vocals aren’t too loud compared to the music anymore. While the epic soundscapes and the harsh vocals are still there, along with the folky sounds, I think it sounds a little bit more power metal through the drums and guitars. You can definitely hear that these guys have a lot potential in making music and they already improved since their demo. So, you like folk metal? Go listen to Atlas Pain’s Behind The Front Page.